The Hampton Inn - Suites Ft. Myers-Estero FL hotel is strategically located at I-75 exit 123 at the intersection of Corkscrew Road and I-75 15 minutes from the Southwest Florida International Airport. This Hampton Inn - Suites hotel in Estero Florida is located less than a mile from Miramar Factory Outlets and walking distance of two casual restaurants. Our hotel has easy access to Ft. Myers Beach Naples Florida Gulf Coast University golfing fishing and many other local Florida attractions. The Hampton Inn - Suites Ft. Myers-Estero FL hotel features five floors 94 rooms interior corridors tropical landscaping and upscale decor. Every room has a microwave and refrigerator. Our hotel also offers 28 suites that sleep up to six people per room. 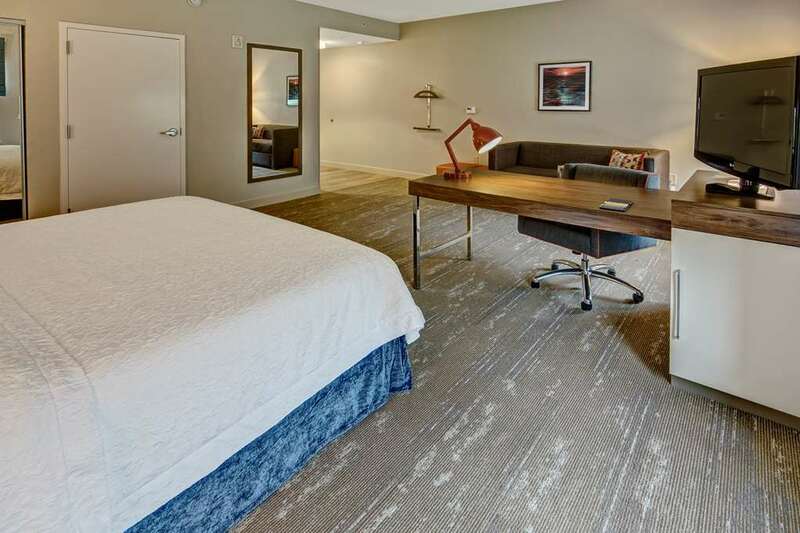 Additional features of our hotel include an exercise room business center guest laundry meeting rooms heated outdoor pool safe deposit box and express checkout. At the Hampton Inn - Suites Ft. Myers-Estero FL hotel standard room amenities include complimentary hot breakfast in-room coffeemakers hair dryers irons and boards high-speed internet access in all guest rooms and wireless access throughout the hotel. Enjoy a complimentary copy of USA Today available in the hotel lobby Monday through Friday. Our Hampton Inn - Suites hotel also offers connecting rooms cribs and a Suite Shop for that midnight snack. We love having you here at the Hampton Inn - Suites Ft. Myers-Estero Florida hotel. Roy*s: Located at the Promanade-Roy*s a unique dining experience.